Food Wishes Video Recipes: Let Gorgeous Gluten-Freedom Ring! The beautiful video you're about to enjoy was produced by friends Diane Cru and Todd Porter, the rock star bloggers behind the extraordinary White on Rice Couple. We met Diane and Todd at Kingsford University, and hit it off instantly. They are simply a force of nature – driven, ultra-talented, and quick to generously share their considerable skills. KU was also where we met the stars of the video, Shauna James, Daniel, and Lu Ahern. 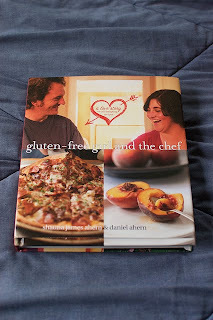 Their blog, Gluten-Free Girl and the Chef, is considered one of the Internet's top GF resources. I thoroughly enjoyed their company, and it was great fun being able to share a few days in the Sonoma wine country with such kindred souls. The video highlights their soon-to-be-released cookbook: Gluten-Free Girl and the Chef: A Love Story with 100 Tempting Recipes, which will be published on September 28th, 2010. In addition to calling my GF fans' attention to this amazingly beautiful cookbook, I'm posting this to show you what my videos could, and should, look like. When I see the magic that Diane and Todd, as well as my friend Liza from Food Curated, are doing with digital video, I'm inspired to continue learning and improving my game. If you're interested in the cookbook, you can pre-order it on Amazon, Barnes and Noble, and Powell's right now. Enjoy! Thank you for the kindest words ever, John. But you are always an inspiration to us. Your warm, entertaining, engaging and informative recipe videos have us drooling and hungry! Liza's work is amazing too and it's an honor to be a part of this great video community. hooray for the Aherns spirit and work! Coming Soon: Four Fabulous New Video Recipes! Warning: Chef Trying to Redesign Blog! Who Dat Flying Back to San Francisco?